Should we ban PET bottles? The choice between PET and glass bottles for high volume, mass consumption applications is not an easy one and is worth debating. A recent article in DNA reported that the Maharashtra government plans to introduce a ban on plastic bottles, starting with government offices and educational institutions in March 2018, and then eventually banning these everywhere else. Most of the plastic bottles that we encounter are PET bottles, made from a plastic called polyethyleneterephthalate. India produced about 1.5 million tons of PET in 2015-16. Almost all the PET produced goes into making the roughly 7 billion PET bottles that are consumed globally each year. These bottles are designed as “use and throw” disposable objects. This is clearly an unsustainable proposition, at odds with the paradigm of a circular economy where we minimize waste by increased reuse and recycling. Therefore, is banning the use of plastic PET bottles the way to go? Unfortunately, this isn’t a particularly straightforward question to answer. While PET bottles are mostly used only once (or, in our country, a few times), the bottles constitute a valuable component of the waste stream. What this means is that there is sufficient economic value in used PET bottles for it to be worthwhile for rag-pickers to separate these out for resale to recyclers. Therefore, unlike other packaging plastic materials such as thin polythene plastic carry bags, a large fraction of the used PET bottles are recycled and reincarnated as fibers for carpets, etc. So, while we do use a large number of PET bottles, a reasonable fraction of these, at least in India, are collected and recycled – in the process supporting an industry that employs a large number of people. 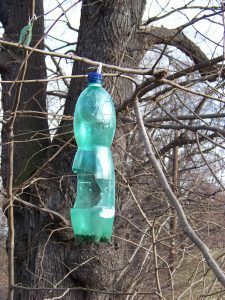 Finally, is there a feasible alternative to PET bottles? The DNA report quotes the Maharashtra Environment Minister, Mr. Ramdas Kadam saying that mineral water producers could switch to glass from PET. Is the use of glass bottles more environmentally friendly than PET? Glass is significantly heavier than PET, thus leading to increased vehicular emissions during transportation. Glass is also significantly more brittle as compared to PET, increasing the chances of breakage during transportation/use. Therefore, the choice between PET and glass bottles for high volume, mass consumption applications is not an easy one and is worth debating. Should we as a society move away from the increased use of PET bottles? Is there such a thing as responsible use of PET bottles? Do feasible alternatives exist to PET, or can such alternatives be created if we were to establish a time frame to phase out PET bottles?